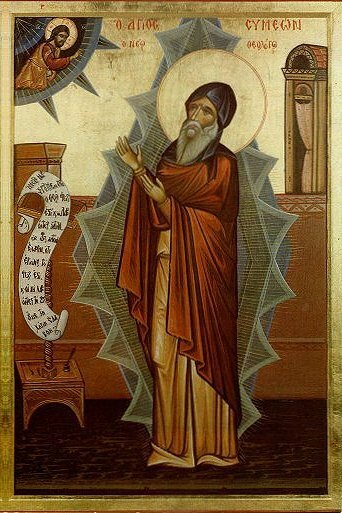 Russian icon: Symeon the New Theologian, anonymous. I have written previously about his experiences of the Divine Light, and his writing in Hymns of Divine Love. Here I relate perhaps his very first “First Vision” experience of that Light which he wrote in a homily called On Faith, which he experienced prior to becoming a monk. He seems to have related this experience in the third person, under the name “George,” which may have been his own birth name. When this vision was over and the young man, as he told me, had come back to himself, he was struck with joy and amazement. He wept with all his heart, and sweetness mingled with his tears. Yet – how unpredictable are Thy ways. Lord – he had only to hear of these divine realities and he believed in them immediately; indeed, he believed so surely that he implemented his faith in corresponding action. It was thanks to this action that his mind took wing and rose to heaven, drawing to it the compassion of Christ’s Mother. Through her intercession God was appeased and bestowed on him the grace of the Spirit. This gave him the strength to rise to heaven and to behold the light that everyone longs for but very few attain… for the love of that for which he was searching took him out of the world, beyond nature and all material things, filling him wholly with the Spirit and transforming him into light. After great labors and many tears, combined with strict solitude, total obedience, the complete elimination of my own will and many other rigorous practices and actions, I have been going forward resolutely and unremittingly along my path, and have again been granted a vision, faint as it is, of a small ray of that most gentle divine light, although up to now I have not been privileged to see it as I saw it on that original occasion. He was a young man seeking God. He read some passages in a holy book which deeply impressed him. He knew from that reading that he could approach God, and that God would reveal “His” will. He spent time in intense prayer, pouring out his heart, believing he would receive. As he was praying, suddenly a divine light appeared above him. Eventually the light filled his surroundings. He seemed to ascend into a different space, apart from his natural surroundings. He entered a heavenly place apart from the Earth. He felt delivered from fear, anxiety, and all human problems (sins?) in his mind. He was united with the light; the light filled him. He felt filled with the Spirit. He was filled with “unspeakable”/”inexpressible” joy. He saw something in the light, perhaps a clearer Light of God. A person appeared standing next to that Light. When the vision ended, he felt he came back to himself. He was filled with joy and peace/sweetness/love afterwards. He felt that later he succumbed to temptations and many transgressions, falling from the divine heights he had received in his first vision. Through prayer, and seeking God again, he was privileged with further light and revelation. Pingback: Yet another “First Vision” Account from St. Symeon the New Theologian – Thy Mind, O Human!